My best girlfriend’s neighbour lost her dog this last week. 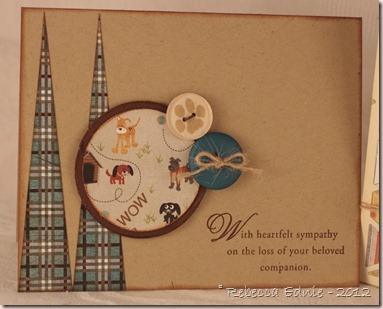 I knew she would buy a sympathy card so I offered to make one for her to give. First, I decided to try out my new hex cover plate die from PTI. I had to die cut it three times before I finally got the right combo of number of passes through the machine and shim. I think my plates are old and that is part of it but it is a tricky thing to cut even with a new plate. Don’t start using it the first time on your last sheet of paper! Test it out first! 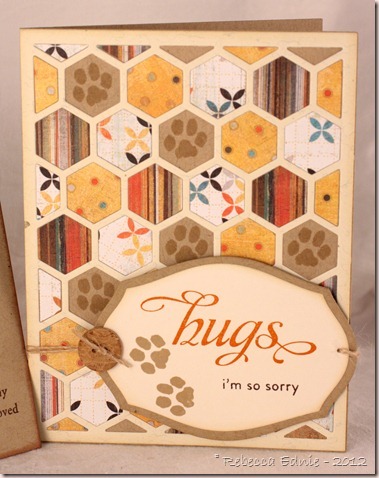 I used Nichole Heady’s PDF cutting diagram for 4 patterned papers but I substituted paw stamps for one of the papers. I love how it looks. I decided it was just too much work to give to someone I don’t even know so I’m going to save it. Then I made another one for my girlfriend to give away using this week’s Unscripted Sketch. 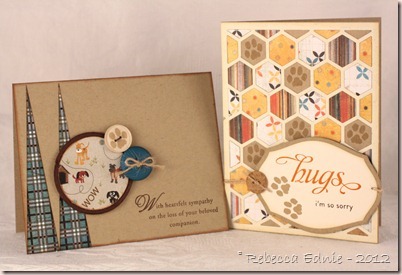 I made the button with the same paw stamp I used on the other card. It’s clear with glossy accents as adhesive. I was going to use a grey button from the pack that matches the paper but another button from another Basic Grey pack in this gorgeous teal colour really popped. Click on the sketch to visit the challenge post. I hope these cards bring some comfort. It’s so awful to lose a special pet. Ink: chocolate, kraft-PTI, Antique Linen, Vintage Photo Distress, pumpkin-SU! What a thoughtful thing for you to do … and such a lovely card for the situation … so glad you joined us at Unscripted Sketches. These are absolutely beautiful cards. I agree, the teal button was a great choice! Thanks for joining us at Unscripted Sketches this week. 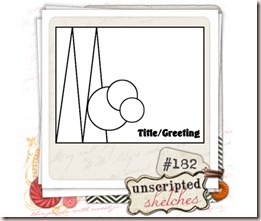 Great use of the sketch – thanks for linking up at Unscripted Sketches this week! Fabulous cards! Thanks for playing at US!